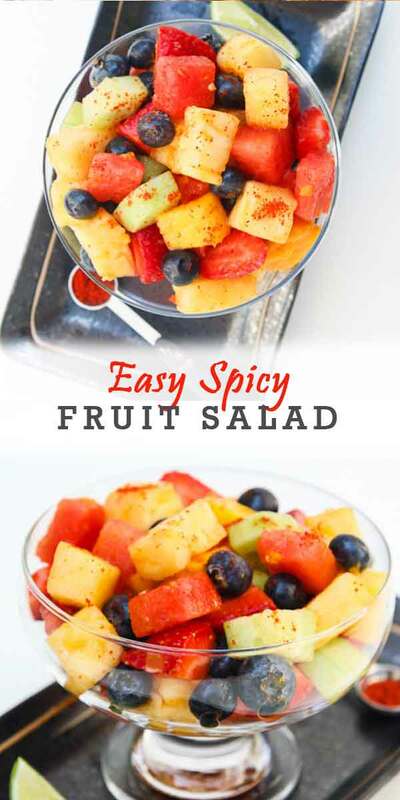 Spice up your typical fruit salad by making this Spicy Homemade Fruit Salad! The chili and lime juice enhances the flavor of the fruit, making it the perfect side! We go through so much fruit in our house. We use it in our morning oatmeal, freeze it for afternoon green smoothies, juice it, add it as toppings to various dishes, use it in blender ice creams, and of course, eat it in it’s natural form. There’s seriously never enough. My 6 yr old son, especially, goes through fresh fruit like it’s candy, which is a great problem to have. Can you believe I had to scold him once for sneaking in too many bananas last year?? I’m not kidding. Well, this recipe is one more perfect way to enjoy your favorite fruits, although it may not be one for kids unless they like a little heat. 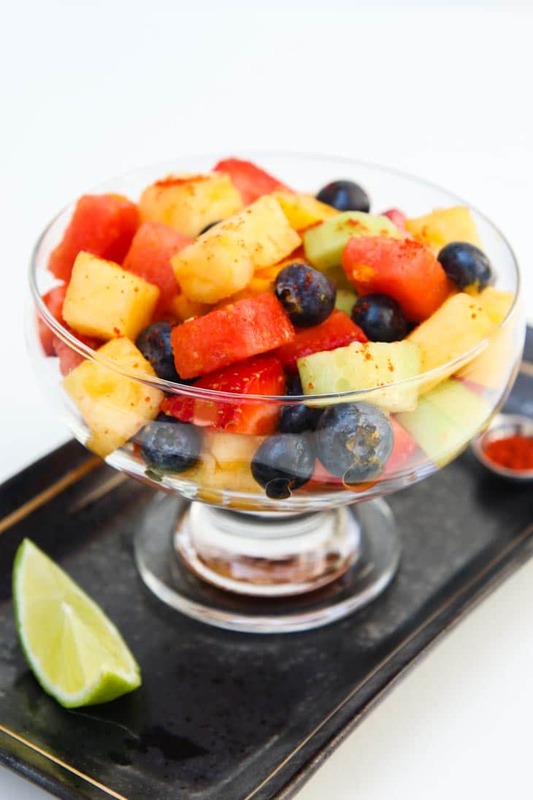 Add a kick to your typical bowl of mixed fruit this Cinco de Mayo with this Spicy Homemade Fruit Salad. It’s the perfect way to kick start your fiesta next week! This recipe, although simple, was inspired by a starter my husband and I enjoyed at a new taco shop we tried out over the summer. This appetizer was the only vegan appetizer on the menu. I honestly wasn’t expecting much from this fruit salad, but I ordered it anyway because it was scorching hot out, and it seemed cool and refreshing. Well, I couldn’t put my fork down after they served it. So much so that I would have honestly been fine ordering another plate of this fruit salad and calling it lunch (which I’m glad I didn’t since their two vegan tacos were also delicious). I generally love fruit salads, but this one really took it up a notch with the added level of spice and acidity. I knew I had to create a version of it at home with some of my favorite fruits, so here it is, this quick and easy Spicy Homemade Fruit Salad! Here’s a list of the fruit I used to make this simple homemade fruit salad. I find it the best combo but you could use your whatever your favorites are! The watermelon is super fresh and goes perfectly with the tart berries and zingy mango and pineapple. If you like heat, this homemade fruit salad is a great way to change up a typical side, appetizer, or afternoon snack. The chili and lime juice really enhance the flavor of all the fruits, and it’s so easy to make. Of course this fruit salad is one my 6 yr old won’t touch since he can’t handle spice. On the other hand, my 3 yr old loves it! Try it out this Cinco de Mayo and let me know what you think. This is a great twist on a classic fruit salad recipe! Add some spice and tartness and take this to your next summer picnic! Combine all the fruit in one large mixing bowl. Add the lime juice and chili powder and combine. Adjust the amount of lime juice and chili powder if necessary. Chill in the fridge and pull out when you're ready to serve! Feel free to use any combination of fruit, depending on what you prefer or what you have available. You can use any other spicy seasoning mix in place of the chili powder. 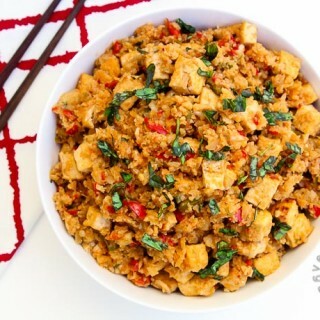 Then you'll love this recipe...super easy, sweet, acidic, and spicy! My husband and I love it...makes for a nice change to your typical bowl of fruit! 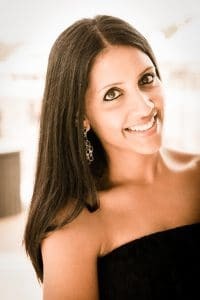 Hahaha Wow, it may be an indian thing too :) That sounds sooo delicious! One of my favorite things is chili, or any spice, on my fruit!! Especially pineapple. SO good. Thanks Sophia! The spicy has a way of bringing out the sweetness! I am all about having chili with my fruits! In Malaysia we eat a fruit salad called rojak drenched in a thick caramel-like sweet-spicy sauce with peanuts. 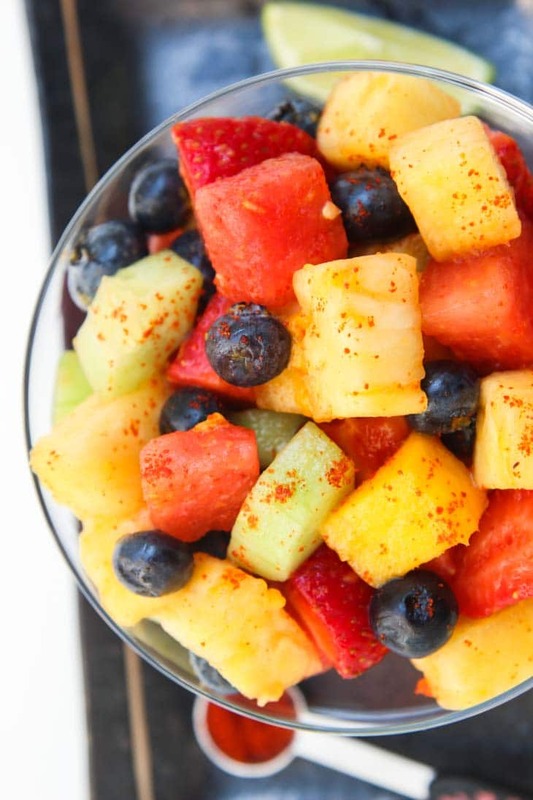 Chili powder is great with some fruits. But never tried to make a salad out of it. This is cool idea! It's basically a 'fruit salad' only composed of fruits. My husband and I love it. 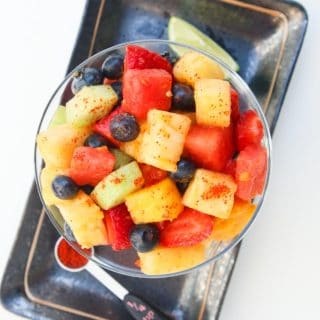 this is my favorite way to eat more fruits..i use indian spice mix, this looks sooo good and refreshing! I've had the version with Indian spice mix several times growing up, but was never a huge fan. But I love this simple chili powder + lime juice combo! I adore chili but have never thought to pair it with fruit. What a great idea and it sounds delicious. Thanks Mel! My parents used to do it all the time, but they had always included other Indian spices which I've never been a huge fan of. But simply adding some chili powder and lime juice tastes amazing! Yay! I thought I was the only one who liked spicy fruit. This looks and sounds like the perfect fruit salad. My mom-in-law made it often, but always added other spices to it and i was never a fan. But chili powder on it's own with some lime juice is amazing!! 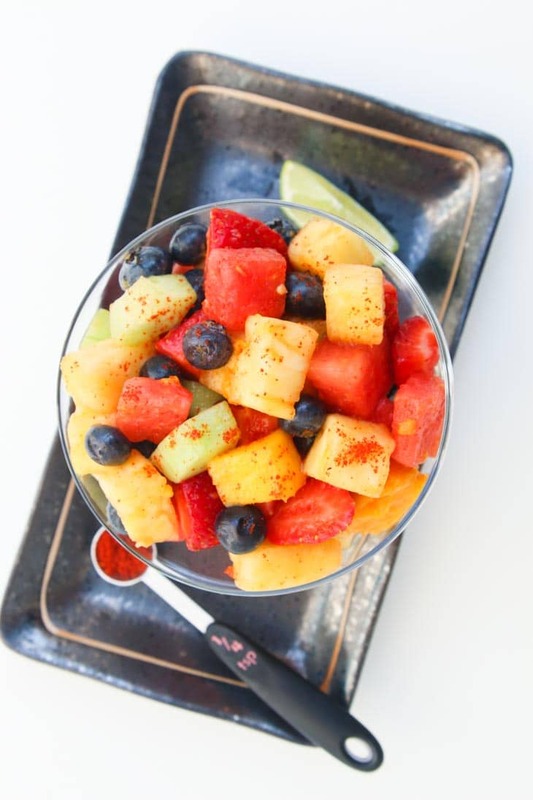 I love the combo of sweet and spicy, it's one of my favorite combos, so a great idea to add chili powder to fruit! Chili powder is probably my favorite spice too, use it on everything! Thanks Brandi! I used to use chili powder ALL the time, especially in indian cooking, but my son can't even handle black pepper so not as much anymore. I've been loving it on fruit! Love the colors n combination of fruits. 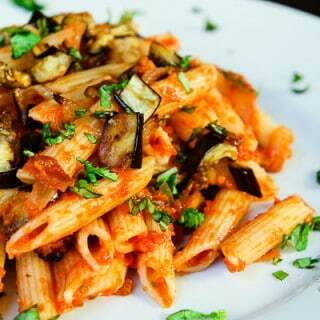 We also make something similar to this and it's such a healthy n pretty looking dish. With chili powder test very good.